Docparser is a web-based document processing software which allows users to retrieve data trapped inside PDF documents. With Docparser, users can extract text data fields (e.g. Purchase Order Number, Date, Shipping Address) and tabular data from PDF documents and move the data to where it belongs. Docparser includes a number of integration options to help users fetch documents automatically from their cloud storage provider and copy the extracted data to their database, spreadsheets, ERP systems, etc. So much time saved!! I'm fairly new to Docparser, but can say that it has saved me so much time. Time and money saved by automating the input of sales lead information into our CRM with Salesforce. It's awesome. The ease of setting up a new document is fantastic. The biggest issue I've had in the past with other services is that it is rarely consistent with the accuracy when parsing the information. I use it to pull information from sales leads that come in by email with a PDF attachment that contains the lead information. My process in the past was to have to manually type the info into a spreadsheet or into my Salesforce account directly; which is very time consuming for my clerical staff. I've automated this process by having the email automatically forwarded to my Zapier account, then they Zap it to Docparser. Docparser then works their magic and sends it back to Zapier that takes the accurate information and uploads it to my Salesforce and starts the lead followup campaign and notifies me that there is a new lead to contact. I tried other services in the past, but if there was any variation in the information on the PDF (even one extra space) the information was not accurately parsed. I've set Docparser up and have run 100s of leads through it with 100% accuracy and no need to tweak anything. It is worth every penny and has saved me an absurd amount of time and money spent on paying my staff to manually input the information; not to mention, it allows me to get back to the potential client in a matter of a couple minutes from the initial inquiry time. Thank you Docparser! PS - The Customer Support department rocks too. They were very helpful! The ease of setting up a new document is fantastic. The biggest issue I've had in the past with other services is that it is rarely consistent with the accuracy when parsing the information. I use it to pull information from sales leads that come in by email with a PDF attachment that contains the lead information. My process in the past was to have to manually type the info into a spreadsheet or into my Salesforce account directly; which is very time consuming for my clerical staff. I've automated this process by having the email automatically forwarded to my Zapier account, then they Zap it to Docparser. Docparser then works their magic and sends it back to Zapier that takes the accurate information and uploads it to my Salesforce and starts the lead followup campaign and notifies me that there is a new lead to contact. I tried other services in the past, but if there was any variation in the information on the PDF (even one extra space) the information was not accurately parsed. I've set Docparser up and have run 100s of leads through it with 100% accuracy and no need to tweak anything. It is worth every penny and has saved me an absurd amount of time and money spent on paying my staff to manually input the information; not to mention, it allows me to get back to the potential client in a matter of a couple minutes from the initial inquiry time. Thank you Docparser! PS - The Customer Support department rocks too. They were very helpful! I use the software to scan pdf invoices & orders for a retail gift store and create inventory lists. time savings. I'm trying to bring a store that was operated for 25 years without an inventory system into a modern age. I like being able to have multiple document templates as each vendor tends to have their own "take" on what is useful to include in an invoice or order and formatting can vary a great deal. Therefore, my templates are not based on vendor name - they are based on the data found in the invoices. Example file names: "line-qty-units-isbn13-desc-discount-level-ext-dollar" or "line-qty-desc-unit-ext-float" Vendors aren't always consistent from invoice to invoice. They may be using software that resizes table columns to fit the text, which means you have to adjust your table format slightly each time to ensure the parsing is correct. That's easy to do. The forums and Q&A resources are usually helpful and I've found them responsive to email. I like being able to have multiple document templates as each vendor tends to have their own "take" on what is useful to include in an invoice or order and formatting can vary a great deal. Therefore, my templates are not based on vendor name - they are based on the data found in the invoices. Example file names: "line-qty-units-isbn13-desc-discount-level-ext-dollar" or "line-qty-desc-unit-ext-float" Vendors aren't always consistent from invoice to invoice. They may be using software that resizes table columns to fit the text, which means you have to adjust your table format slightly each time to ensure the parsing is correct. That's easy to do. The forums and Q&A resources are usually helpful and I've found them responsive to email. 1. The UI for making changes to the template. I hate the popup box routine at the end of making a change. It takes a lot of mouse clicks. 2. I've never gotten the subtemplates to work. (see note above about vendor formats being inconsistent.) Subtemplates "supposedly" take care of minor variations and can be grouped according to a vendor name. Maybe this works for other customers, as it is a great idea. 3. There are a lot of little tweaks to be made that aren't obvious to improve character recognition. Why not start with the highest level of quality (ie. turn on OCR) at the start? If that makes file size a problem for storage or performance when processing a lot of files at once, walk people through how to "downgrade" to an acceptable level or establish a recommended number of files not to exceed some size limit. For example, during a trial scan there were no extra spaces or funky characters in the document but then I figured out about half of the "6s" had been transformed to "8s" - not terribly helpful. I want to be able to trust the result rather than having to proof hundreds of line items. 4. Given the inconsistencies I have with the input data sources, I don't think I'll be able to automate the parsing tasks - such as grabbing attachments from email automatically. Again, I have a small business, so I'm OK with the workaround. They have been very easy to work with.We need to manage thousands of PDF invoices and were typing up the details manually. We found Docparser and it has been a amazing. We created parsing rules that allowed us to take very fragmented data and get it into an orderly format that can be pulled into excel. There are multiple PDF formats and all could be pulled in with Docparser through their flexible tools. We are converting about 3500 invoices per month but expect this to grow significantly in the future. This tool is giving us a simple way to grow our business because it is automating tasks that used to take hours. The best part is our previous process was prone to errors which this eliminates. In my searching for solutions, I did not find anything else that would do what Docparser does that would be simple, cloud based and affordable. We need to manage thousands of PDF invoices and were typing up the details manually. We found Docparser and it has been a amazing. We created parsing rules that allowed us to take very fragmented data and get it into an orderly format that can be pulled into excel. There are multiple PDF formats and all could be pulled in with Docparser through their flexible tools. We are converting about 3500 invoices per month but expect this to grow significantly in the future. This tool is giving us a simple way to grow our business because it is automating tasks that used to take hours. The best part is our previous process was prone to errors which this eliminates. In my searching for solutions, I did not find anything else that would do what Docparser does that would be simple, cloud based and affordable. It took a bit of time to set up the templates but nothing that seemed out of the ordinary for the fragmented data we were trying to convert. I've tried several services now, this got me to where i wanted to go and it works flawlessly with MS Flow or Zapier... so i upgraded and will go full in on DocParser.DocParser's approach to creating parsing rules has been the BEST fit for what i use it for. Delve fully and explore all the available methods and you'll find a way to extract the data you want. DocParser's approach to creating parsing rules has been the BEST fit for what i use it for. Delve fully and explore all the available methods and you'll find a way to extract the data you want. Sometimes line by line changes take an extra second to save and the pages take an extra second to load, adding to the overall time it takes to set something up. I'm sure speed will improve over time, the product makes up for this shorterm annoyance. Has a lot of flexibility to identify data that may be displayed in multiple ways using a dictionary of words to detect what you are looking for. DocParser has allowed us to extract data from purchases and put it into a database to analyze for future purchasing needs. I have nothing bad to say about DocParser thus far. If you think there is a feature that's lacking I suggest browsing their documentation because I learned I was doing a work around for a feature they had already implemented (different layouts under the same parser). Batch convert PDF to Excel, CSV, JSON or XML. Extract data trapped in PDF documents on scale. Automatically move parsed data to Database or cloud application. Fully automate document based workflows. Below are some frequently asked questions for Docparser. Q. What type of pricing plans does Docparser offer? Q. Who are the typical users of Docparser? Q. What languages does Docparser support? Q. Does Docparser support mobile devices? Q. Does Docparser offer an API? Yes, Docparser has an API available for use. Q. 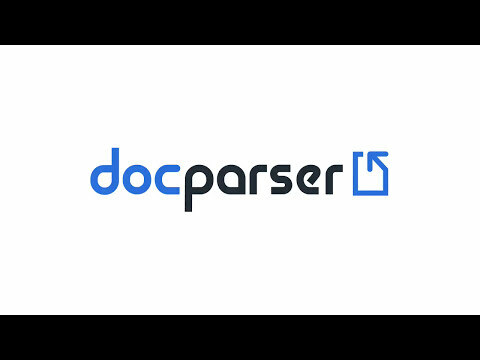 What other apps does Docparser integrate with? Q. What level of support does Docparser offer? Q. Which apps is Docparser compared to most often?